It is time to introduce Savannah and Chris’ wedding attendants. They chose closest family and friends to be members of their wedding party. We have already met several of the wedding party members when learning about the proposal. First is Savannah’s sister, Athena Hobbins. Athena is Savannah’s Matron of Honor. Next is Michelle Zubasic, one of Savannah’s best friends. Michelle was also present on the engagement day and is a bridesmaid. Savannah’s best friend, Michelle, Chris, Savannah, Savannah’s sister Athena and husband Derek just after Chris’ engagement proposal. Savannah comes from a large family and granted her younger sister, Jiselle, the honor of being Maid of Honor. Sisters Gabrielle and Johna will also be alongside Savannah as will Chris’s sister, Katie. Another one of Savannah’s besties, Lizzi Holmes, will stand up for her. The flower girl is Chris’ cousin, Maureen Hennelly. The ladies are using an online rental service for the bridesmaids dresses called Vow to be Chic. This service has been a great experience so far – Savannah was able to select the same designer and same color but with different styles so that each member of the bridal party could find a style that best fits her – and one in which she feels amazing. Each of the ladies simply went to the website and selected her style and size and ordered it as part of Savannah’s wedding day. Dresses will be sent prior to the wedding date with a 2-week rental period provided. When the day is done, returning the dresses is as simple as dropping them off at the post office. 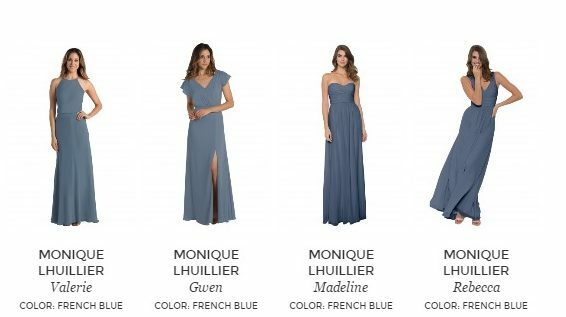 The dresses are a French blue color which Savannah chose for its soft and natural feeling – stunning! Chris chose his best friend, Josh Shaffer to act as Best Man. Both of Chris’ brothers, Billy and Ryan are wedding party participants. 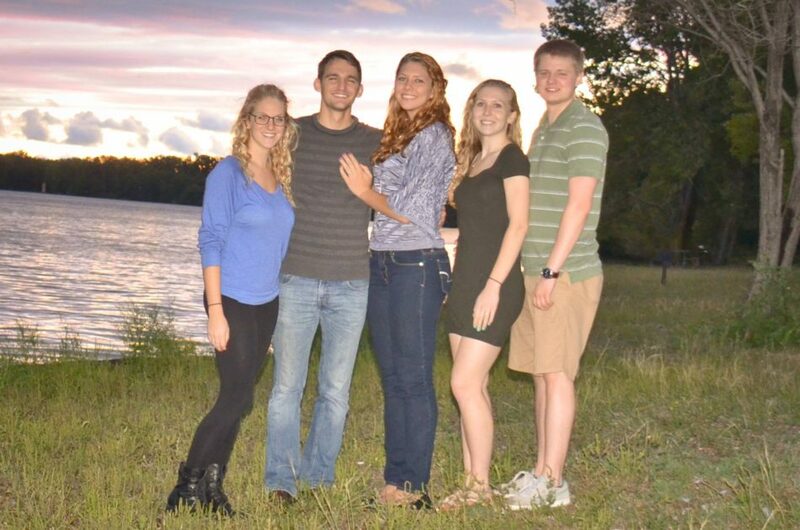 Additional family members who are part of the big day include Savannah’s brothers Jordan and Noah; and, Savannah’s brother-in-law, Derek Hobbins (he was the one who sneaked the proposal photos without Savannah knowing). Chris’ friend, Daniel Finger is a groomsman and Luke Tarr is the ring bearer. Chris’ friend, Patrick Bertolini will play two roles and act as groomsman and Officiant for the ceremony. The gentlemen will wear tailored suits in a light grey, complementary to the French blue. The suits are being sourced from Jos A. Bank. Chris plans to purchase his suit while most of the others will rent from Jos A. Bank. 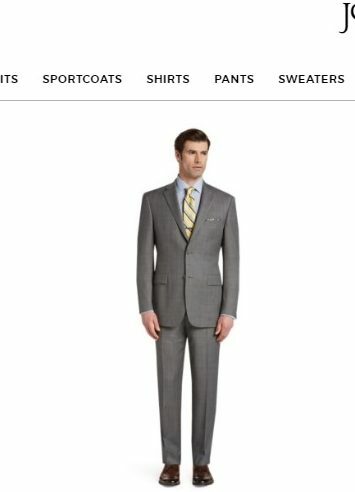 The suits are pictured below. With the wedding party aligned, it clearly will be an amazing day at Quincy Cellars for all of Savannah and Chris’ family and friends! One year after Chris proposed to Savannah, they decided to shoot their own engagement photos. They sought a natural, casual and romantic look for the special sitting. Chris is a photographer and was excited to try out his profesional selfie skills! 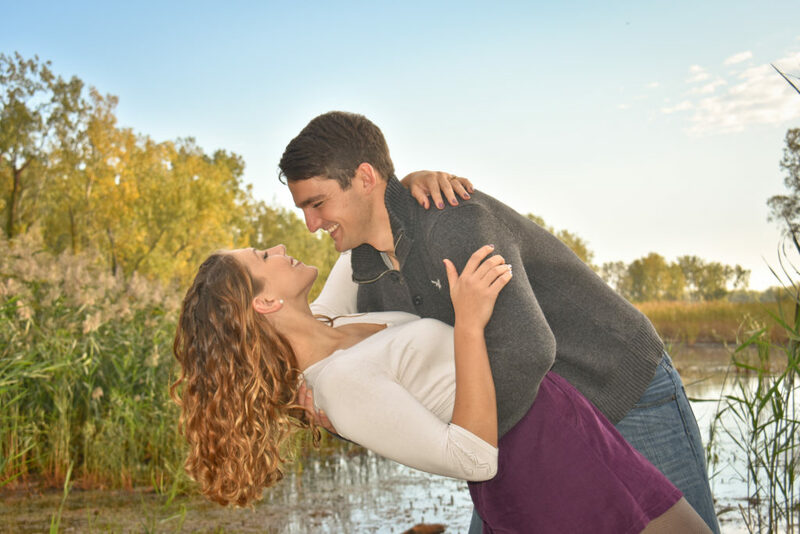 The engagement photos were taken in Autumn to reflect the time of year they first got engaged. They agreed Presque Isle State Park was the perfect choice due to its picturesque landscape and the opportunity to create art. It too is the spot where Chris proposed, making it an even more splendid spot for their engagement shoot. Most pictures were shot at Beach 8 at the State Park. The blog cover shot is a romantic introspection of Savannah and Chris with the brilliant beach-water gleaming. The couple’s beauty shines through and elegantly complements the natural backdrop on each and every photograph. A magnificent historic Light house is shown in the background of this photograph. One of the engagement photos taken of featured couple Savannah and Chris at Presque Isle State Park. Chris gave an exquisitely unique engagement ring to Savannah to show his commitment to her. The next photograph shows a fun side and sheer joy they share when together. It is set next to one of the inlets at Beach 8. The final shot symbolizes their love for one another and the future path they will embark upon together. Savannah and Chris are engaged! 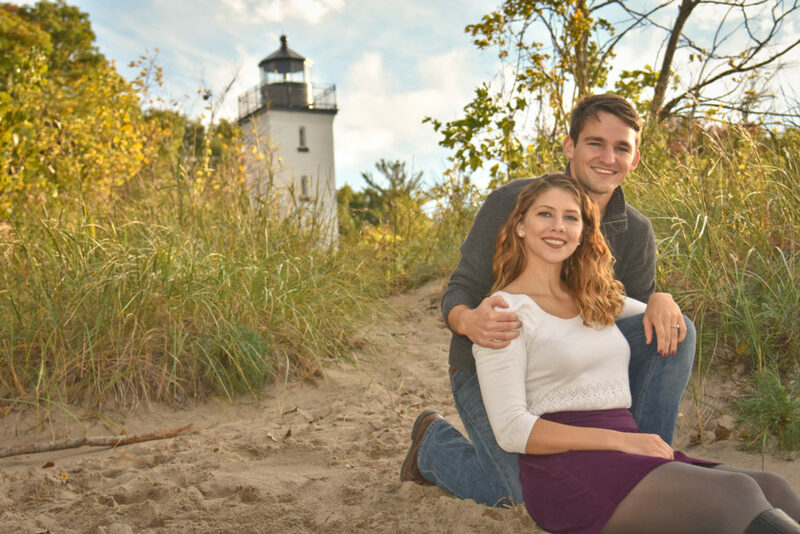 Savannah and Chris are on a romantic walk at Presque Isle State Park “posing” for engagement photos. I believe the photos turned out amazing! 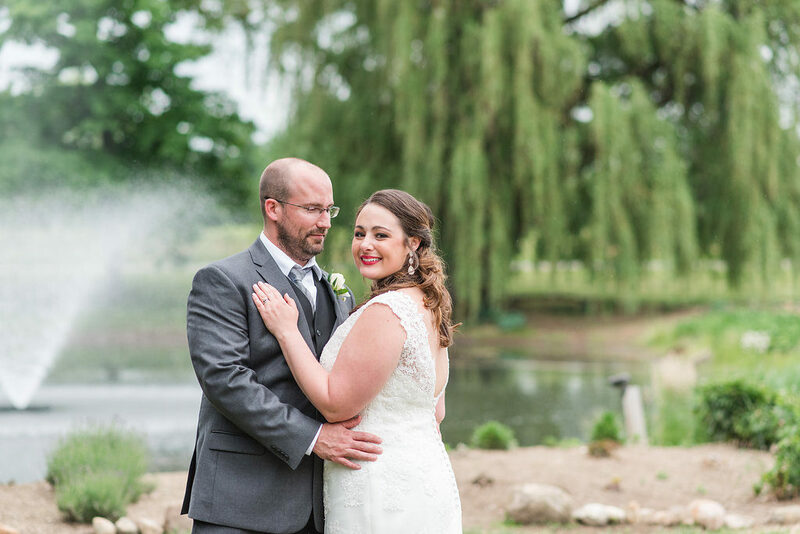 Stay tuned to learn more about this devoted couple’s storybook wedding journey. Chris and Savannah will exchange vows and celebrate at Quincy Cellars, August 12, 2017. 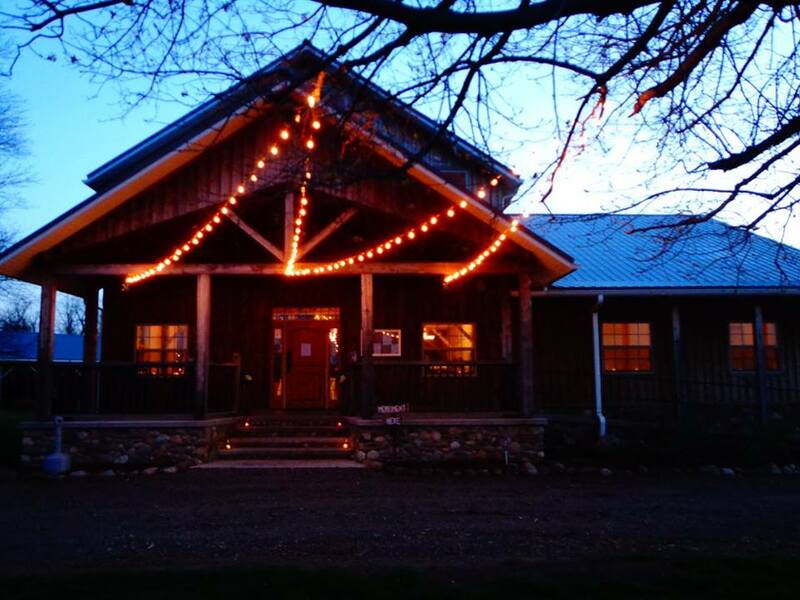 Quincy Cellars Celebrates Its 10th Anniversary! 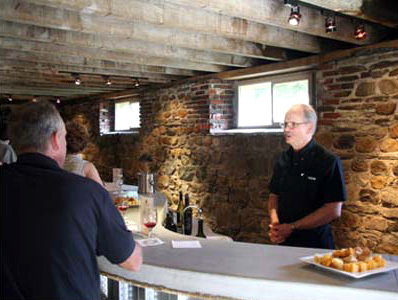 Ten years ago, on June 7, 2007, Quincy Cellars opened its doors. Thank you to all our customers for being such a big part of our journey so far! We had a vision to create a top-notch destination and an unforgettable experience just for you. And so it began with the transformation of the 150-year old barn into an amazingly rustic yet modern event venue complemented by a charismatic wine cellar … and now includes gorgeously romantic outdoors spaces – an open-air pavilion, deck, patio and most recently, a dock over the pond. And did we mention our fabulous food? Award-winning wine? Beautiful gardens? The willow tree? The envelopment of vineyards? Take a look at this video from last year. Or see some shots below. The willow tree. The pond. The fountain. 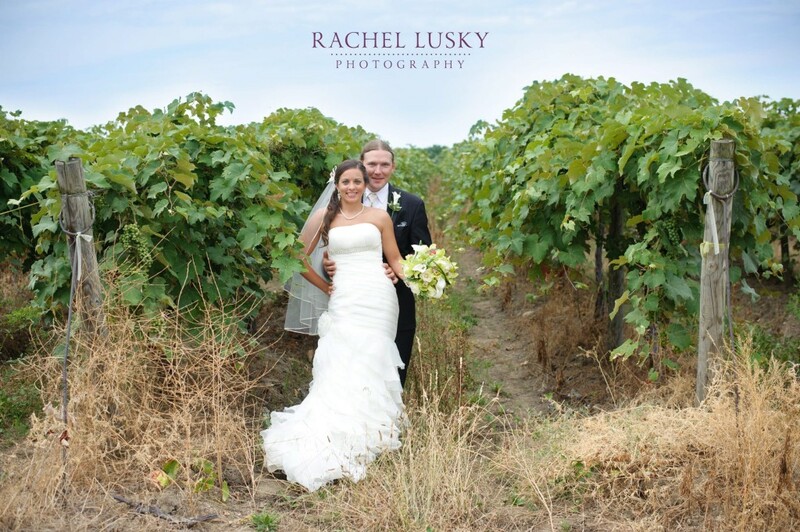 This shot of Matthew and Teresa was captured by Rachel Lusky Photography. Rachel Lusky captures another couple – this time, in the vineyard. The wine cellar in the lower level of the restored barn. With our customers’ continued support and vision, this year – and the next 10, will be even more remarkable!! Chris is an art teacher and a hobby of his is photography. Every month Savannah and Chris travel somewhere interesting together for a photo shoot. So, when Chris suggested to Savannah they go to Presque Isle Saturday, September 19, 2015, she agreed. However, when Saturday arrived, it was raining! Chris insisted it was just misty and would still be a nice photo opportunity. Again, Savannah agreed, thinking it was their usual photo date. She freshly applied her make-up and put on an outfit appropriate for a Fall shoot. Chris went on to say, “all of these photos are special because they make up all the photo dates before we got ENGAGED”. 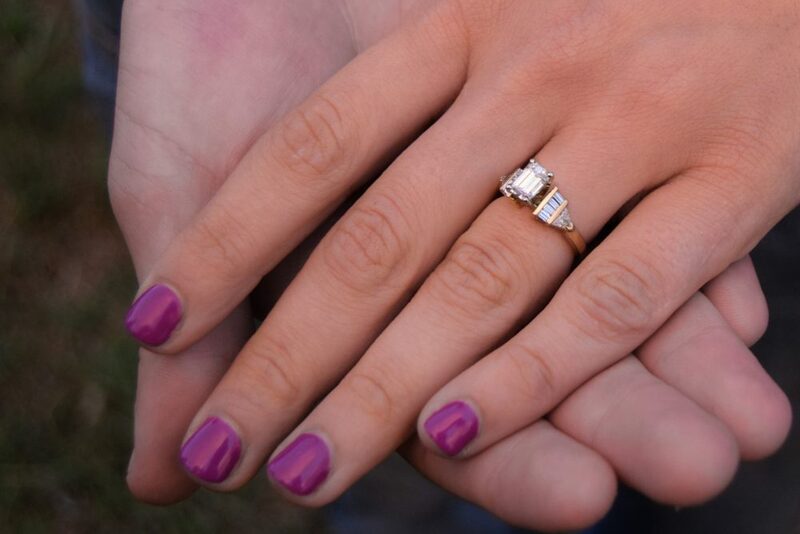 He proceeded to get down on one knee to propose– and Savannah said, “Yes!”. Chris presented Savannah with an exquisite emerald-cut yellow gold engagement ring. Savannah finds the ring very special because Chris took such care finding a ring just to her liking. She tells us now she is so in love she would have said yes even without a ring! 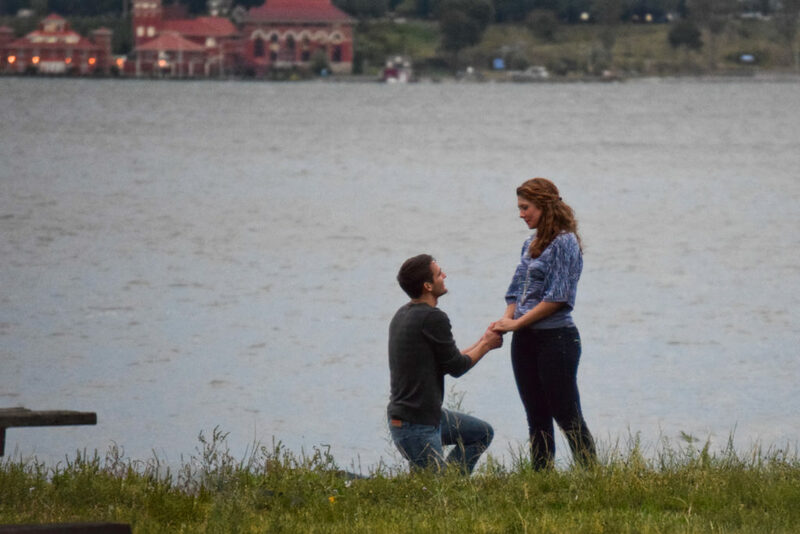 Chris proposes marriage to Savannah at Presque Isle State Park, with the city of Erie in the background. 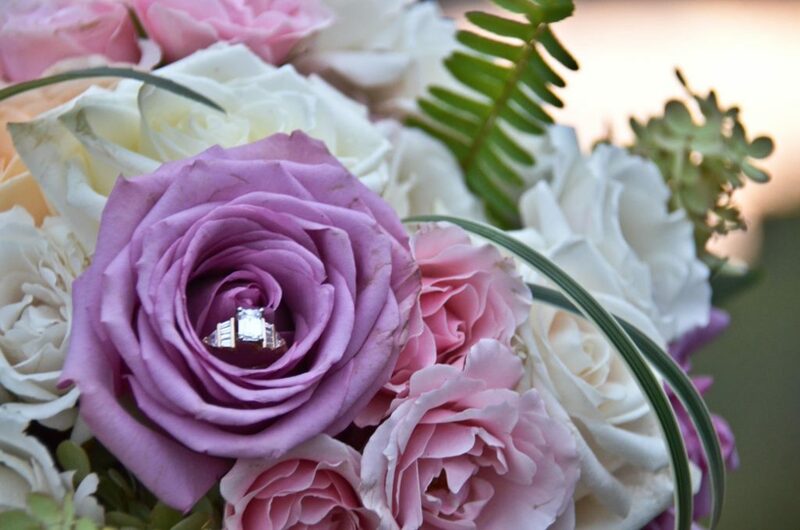 Savannah’s brilliant engagement ring nestled in a lovely bouquet. Chris found an exquisitely unique engagement ring, perfect for Savannah. Chris also planned the day so that a few close friends were present. Savannah’s sister, Athena, her then fiancé Derek, and Savannah’s best friend, Michelle were all hiding in the bushes, watching the proposal go down! Derek was even able to snap pictures of the moment! After the friends and family showed themselves, they celebrated with champagne. It was quite a photo shoot, despite the rain! Great food, wine, and friends who cherish your email and won't ever share it. The Chautauqua-Lake Erie Wine Trail spans from Harborcreek, Pennsylvania, to Silvercreek, New York. The trail is home to native Labruscas, French-American and European style wines. Here, there is a wine for every palate. For more information on the Wine Trail, visit the Chautauqua-Lake Erie Wine Trail. Quincy Cellars is at Quincy Cellars. What a fabulous day for a wedding!! These two and many family members and friends traveled from near and far to celebrate their love for one another! One of the sweetest couples we’ve had the pleasure to work with! Congratulations Travis and Elizabeth! Quincy Cellars shared a post.